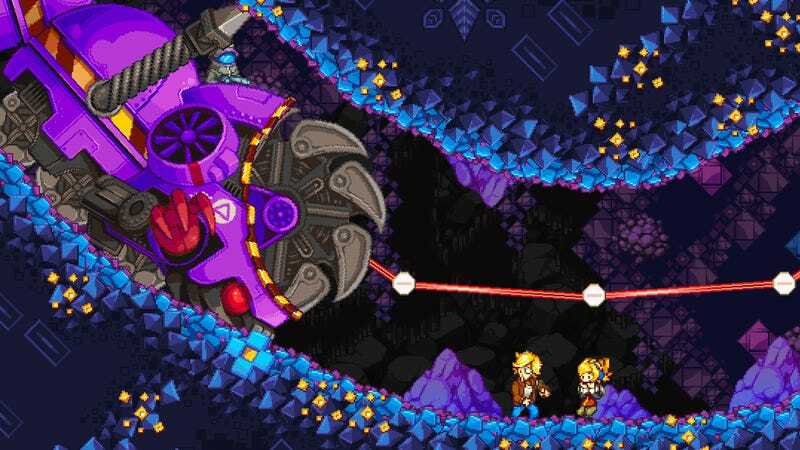 Iconoclasts, out this week on Steam and PlayStation 4, is a game Joakim “konjak” Sandberg has been working on in one form or another for the last 10 years. I’m only a few hours in, but so far, I’d say that work seems to have paid off. It looks like a traditional 2-D platformer with a lovely, pixel-art aesthetic (stay with me), but its ambitions are way bigger. Its levels play out like a series of mini Metroidvanias, gnarled mazes with intersecting shortcuts and paths waiting to be opened by newly acquired abilities. And while there’s plenty of Metroid-style jumping and shooting, the flow of the stages is closer to an old-school Zelda. Rooms are filled with puzzles revolving around some new item or ability, starting out simple and layering on the complexity until it culminates in a boss fight that puts everything you’ve learned to an extended life-threatening test. It’s a design methodology that feels every bit as modern as it does classic, which I feel is just about the highest compliment you could pay to a game of this ilk. I checked out the Metal Gear Survive beta this week, and after spending an hour or so in one weird interpretation of my all-time favorite video game series, I decided to dip back into the last (and maybe only) game where that approach really worked: Metal Gear Rising: Revengeance. After turning surprise Metal Gear Solid 2 player character Raiden into an absurdly awesome cyborg ninja in Metal Gear Solid 4, Revengeance puts you back in his high-heeled ninja boots for one of the most gleefully over-the-top games I’ve ever played. The reason Revengeance works so well is partly because it was developed by Platinum Games, the studio behind Bayonetta, which combined its mastery of the action genre with some of the high-minded philosophy and goofy humor of the main Metal Gear series. That resulted in a game with a very cool parry mechanic that does a good job making you feel like a ninja badass and also has a final boss who ends up being—spoiler alert—a super-powered U.S. senator riding a giant robot. The real star of Revengeance, though, is what they call “Zandatsu,” a finishing move where you can slow down time and line up your sword strikes for precision slashes that can cut enemies cleanly in half or chop them into dozens of little chunks.